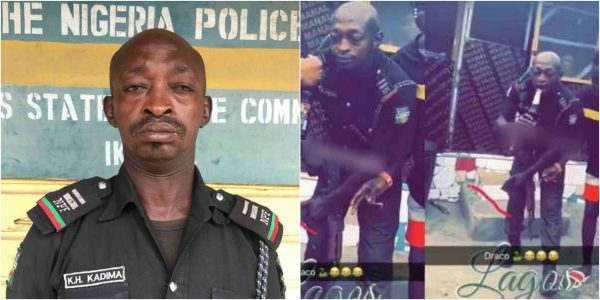 A drunk Police officer , Inspector Kadima Useni, attached to Police Mobile Force, Squadron 22 Base, Ikeja, Lagos State, has been dismissed by the Police after a video of him appearing to be drinking on duty went viral. Lagos State Police Command’s Spokesman, CSP Chike Oti, said that the dismissed policeman was apprehended following a viral video which showed the policeman drunk in Dopemu area of Lagos. “The attention of the Inspector General of Police, IGP Ibrahim K. Idris, has been drawn to a video of a Lagos policeman who got drunk at Akowonjo, Dopemu area of Lagos State. “He, therefore, directed the state Commissioner of Police, CP Imohimi Edgal, to fish out the erring policeman for appropriate disciplinary action. “The policeman, who was stupefied after guzzling large quantity of alcoholic beverage, was located and apprehended today 07/11/2018 at Police Mobile Force Squadron 22 Base, Ikeja, where he served as the Command Provost. “He was identified as Inspector Kadima Useni with appointment number 176219.